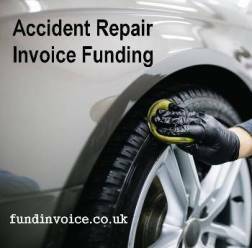 I just did a quick comparison of the factored monthly turnover achieved by some of the car body repair companies that have been using invoice finance, found through us, for over a year. They show a very high turnover growth rate, increasing by a multiple of almost 4 times over the volume achieved a year ago. 3.9 times growth in the volume of invoicing that they factored, when compared with the same month a year ago. This is a great achievement for them, they all grew their turnover, and it is also a demonstration of how using receivables financing can unlock business turnover growth. The way body shop invoice finance works is very straightforward, so it is easy to see the attraction. The funders give their clients 100% of the invoice value, less their fee (typically a few percentage points). This means no waiting around for cash to come in from debtors, so that working capital can be put to good use in the business. As you raise more invoices so more cash becomes immediately available, this removes cash flow as a barrier to turnover growth. The fact that these clients could stop using the facility at any time also speaks to the service that they are receiving - they keep coming back to use it over and over again. We can arrange for a facility to be put in place for your company very quickly. Our record so far is just 7 hours between enquiry and payout (typically customers receive funding in just a few days - the process will work at a pace that suits you).